A recent release from the Federal Reserve Board indicates that consumer credit outstanding grew by a seasonally adjusted annual rate of 6.9% over the year of 2014, accelerating from the 6.0% growth rate recorded in 2013. 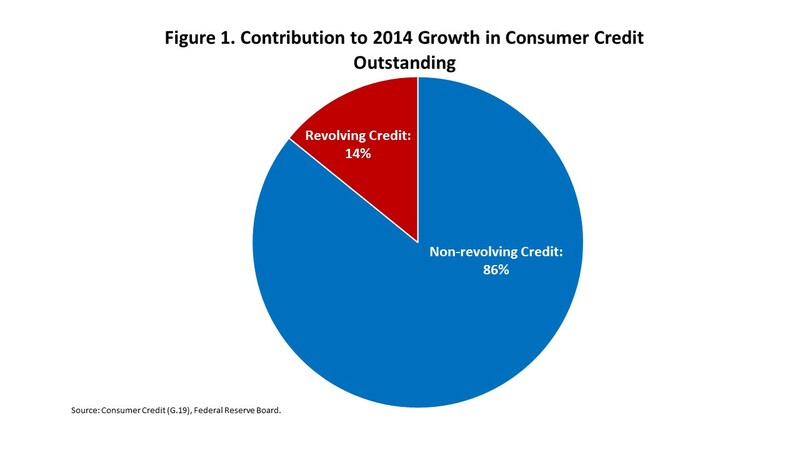 At the end of 2014, there was $3.3 trillion in consumer credit outstanding. The expansion in consumer credit outstanding over the year largely reflected an increase in non-revolving credit outstanding. Non-revolving credit is mostly composed of auto loans and student loans. According to the release, non-revolving credit rose by a seasonally adjusted rate of 8.2%, $183.6 billion, accounting for 86% of the total growth in consumer credit outstanding for the year. The increase in non-revolving credit outstanding in 2014 marks the 5th consecutive year of growth since the 0.6% decline in 2009. Over this 5-year period, growth in non-revolving credit has averaged 8.2% per year. Revolving credit, largely composed of credit cards, also contributed to the annual growth of consumer credit outstanding in 2014. Over the year, revolving credit outstanding grew by a seasonally adjusted annual rate of 3.5%, $30.3 billion, accounting for 14% of the total growth in consumer credit outstanding. Despite its smaller contribution to growth in overall consumer credit outstanding, revolving credit outstanding continues to show signs of recovering. Since declining by 7.6% in 2010, revolving credit outstanding has experienced annual gains in the subsequent 4 years. Moreover, each year of growth in revolving credit has exceeded the increase in the prior year. The 3.5% growth rate in revolving credit recorded over 2014 is the highest rate of growth since the 7.6% increase in 2007. Despite the expansion of consumer credit outstanding over 2014, banks’ assessment of the quality of consumer loans has declined. In the most recent iteration of the Federal Reserve Board’s Senior Loan Officer Opinion Survey, bank officers were asked about their outlook for delinquencies and charge-offs on consumer loans in 2015. A similar question was posed in 2013 with regards to their outlook for 2014. The net percentage is the difference between the share of bank officers saying that loan quality is likely to improve in the coming year and the proportion believing that loan quality is likely to deteriorate in the coming year. The results for each consumer loan product are shown in Figure 2 below. According to Figure 2, bank officers’ outlook for the loan quality of credit cards, auto loans to prime borrowers, and other consumer loan products in 2015 is more pessimistic than their outlook for 2014. 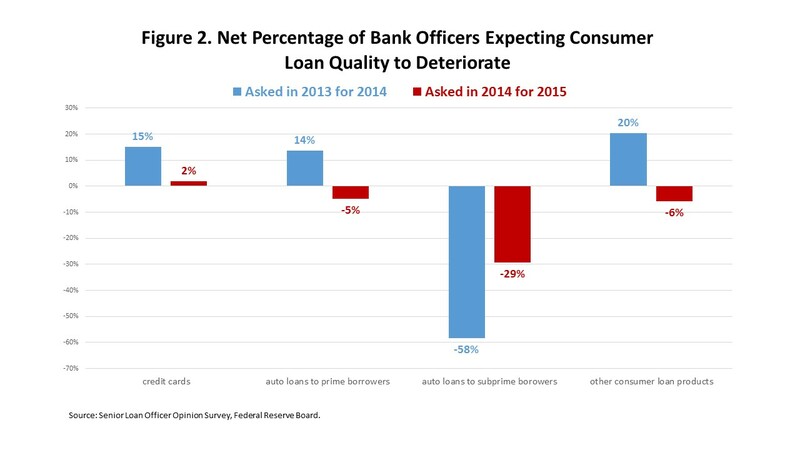 A greater percentage of bank officers expect the loan quality of both auto loans to prime borrowers and other consumer loan products to deteriorate, on net, in 2015, whereas, in 2014, they expected the loan quality of these two categories to improve. Although the net share of bank officers’ outlook for auto loans to subprime borrowers improved from last year, a greater proportion still expect deterioration in auto loans made to subprime borrowers than expect an improvement. Growth in non-revolving credit has accounted for much of the recovery in consumer credit outstanding. However, the results from the Senior Loan Officer Opinion Survey suggest that banks expect some of the auto loans to sour. In addition, serious delinquency rates on student loans remain elevated. A default on any of these loans would make it more difficult for the consumer to obtain the mortgage financing needed to purchase a home. As a result, dynamics in consumer lending could impact the mortgage market. While these risks are expected to be more than offset by continued improvements in the broader economy, we will continue to monitor them for any evidence of a discernible impact on home-buying.